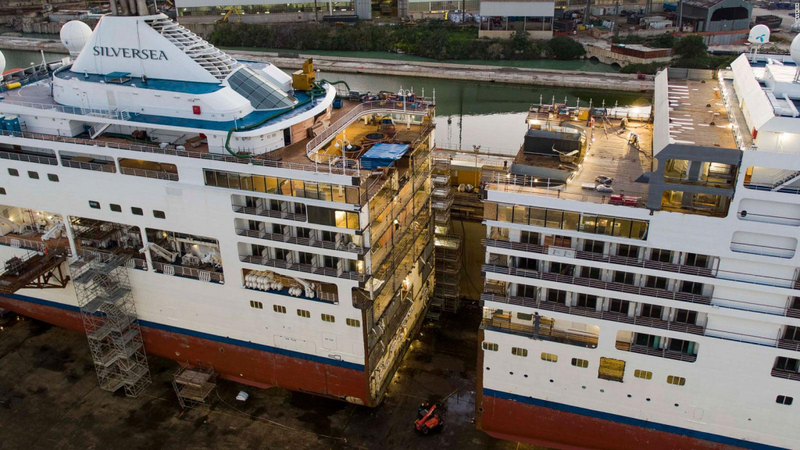 You are here: Home » Blog » Travel » Why Has This Cruise Ship Been Cut In Half? For cruise travelers around the world, mega ships transport them from port to port and country to country in elegant style. And with the popularity and affordability of cruising bringing travelers from more than just the Boomer generation, building new ships might seem the natural solution to a demand for the cruise lifestyle. But it’s not. Several international ships have undergone resizing “surgeries” that expand them by up to 50 feet. How? By cutting them in half. The expansion process involves slicing the ship into two pieces that are then rolled apart and putting the new section of the ship in between, where the pieces are then welded together. A final coat of paint prevents travelers from noticing that their ship was once split in half.